What type of coconut milk? Canned boxed sweetened or unsweetened? 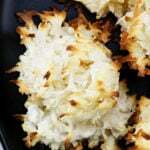 I use canned unsweetened coconut milk for this recipe. Hope this helps! Hi, husband’s birthday is coming up soon. I am planning on using this recipe but I’m confused on the use of the flaked coconut. How much do you use for custard and for the topping? Was so happy to find your recipe. He was so excited to try it. Based on appearance, smell, and taste he said this was hands down the best he has ever had in his 54 yrs of life! This is a huge compliment. He has been spoiled with really good cooks his entire life. Easy to make. Thanks so much for sharing your recipes. I used the pie crust, cream pie recipe, and whipped cream recipes. Aww, this is such a special comment to me, Kari! I’m thrilled to hear that you tried all these recipes (pie crust, coconut cream pie, and whipped cream) and you and your husband enjoyed the pie! Isn’t the pie crust easy to make?! Made this with my student all the way in Beijing! I had to share a little homemade pie with them and this recipe was delicious and fun to make with kids. I was nervous the custard wouldn’t turn out since I had made some once before with sad, lumpy results, but this time it turned out so smooth and thick! And that was using sweet potato starch too! (Couldn’t find cornstarch anywhere, even the import stores) Thanks for the recipe! As always, this recipe was perfect. You never let me down! The only change I made was to put it in a graham cracker/coconut crust, per the recipient’s request. Everyone raved. 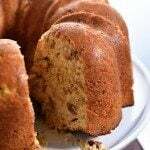 Thank you for posting another great recipe for me to wow my family with. Are you using canned or refrigerated coconut milk? This pie was amazing. I love coconut desserts and this may be the best I’ve had. Crust was perfect. Filling perfect. Whipping cream perfect. Crowd pleaser. Thank you for sharing this recipe. Happy to have found your site! I’m so happy you enjoyed it, Nate! This pie is one of my favorites! And I’m so happy to have you here and glad you found my site too. I hope you find many more recipes that you enjoy. Thanks! 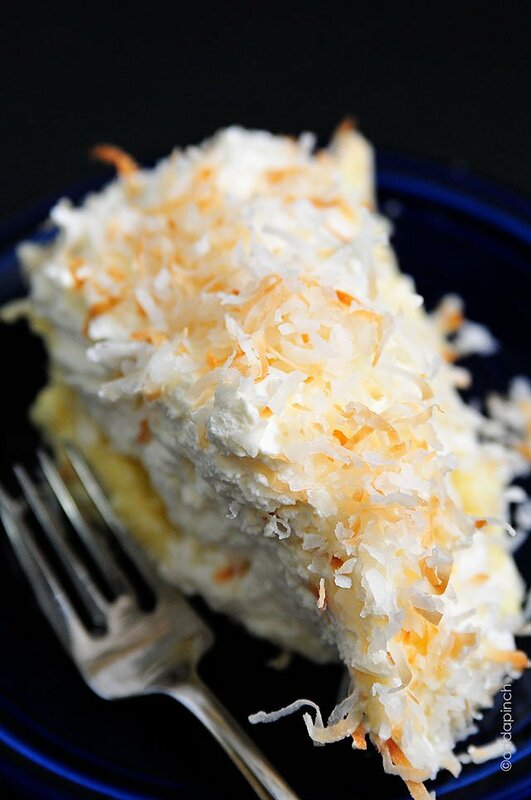 The best coconut cream pie ever! Using the cornstarch for thickening the custard instead of flour gives it a richer, creamier taste. Once you try this pie, you will never use any other recipe. I’m so glad you liked it Pamela! Thanks! 🙂 I’m so glad you love it, Mary! It is pretty amazing, isn’t it?! I just made this pie for the first time for Thanksgiving dinner, as a change from pumpkin pie. We absolutely loved it!! It truly is the best coconut cream pie I’ve ever eaten. I also use the crust recipe that came with the pie and it is very good. Both the filling and the crust are easy to make. I also found a recipe online for homemade whipped cream and put that on top then added the toasted coconut. I think the coconut milk in the custard really sets it off. You will not go wrong making this pie. I’m a big fan and have added this to my pie recipe collection. Can you substitute the half and half ? I love this pie! Two exceptions – first: if you use salted butter don’t add more salt! It was super salty. I tried adding a little more sugar but it didn’t work. Second: use a large saucepan! Mine nearly cooked over. It’s super creamy and light. Other than the salt, which I just added lots of freshly whipped cream to help hide it, We loved it! This recipe is a ’10’ in my book but I have to be satisfied with giving it a 5 as that is as high as your rating goes. 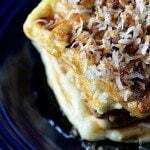 My guests’ comments ranged from “This pie is good enough for you to start your own bakery – it’s really delicious!’ to my favourite ‘This is the best coconut pie I have ever tasted’. I have to agree – it is the best I have ever tasted too! This recipe is now a permanent part of my collection of favorites. This is the BEST Cocounut Cream Pie recipe. The whipped cream on top and the coconut milk in the custard are the two things that make it stand out from the rest. I am planning to bake this pie for Christmas, Do I use sweetened or unsweetened coconut milk? Any help appreciated. Reading some questions about sweetened or unsweetened milk coconut milk I’m not seeing any response. I’d like to find out, I would like your recipe to be perfect. I use like sweetened coconut milk in this, Bev, but you can use unsweetened if you wish. Thanks! Enjoy it! Coconut milk from the carton or full fat coconut milk from the can ? I use coconut milk from the can. My Mom always made coconut cream pies for the holidays. It is now my turn to pass on the tradition. She never used coconut milk to cook with but I really want to change it up a bit. Sweetened or unsweetened milk? What is sweetened coconut milk? Is it in a can? I’ve never seen it. What brand do you use? I’ve usually found it in a can, Matt. I hope you enjoy the pie! Thanks! AMAZING!!!! This is the BEST Coconut Cream recipe I have ever made and eaten!! I did not deviate from the recipe and it came out perfect! 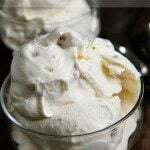 Creamy, very creamy, perfect consistency and a wonderfully rich flavor.. I used my own Pie crust recipe but will definitely try hers next time. I’m very confident it will be as great. I will use this site for future recipes. I made this coconut cream pie for the holidays and it was so delicious and flavorful! Everyone loved it and I mentioned your website. Thank you for sharing this five star recipe, I will definitely be making this again. I am happy I chose to make your recipe because I never made this type of pie before. The instructions were easy to follow and I agree that the coconut milk did wonders. It was delicious!! It was not too sweet, but had plenty of flavor. It really went together quickly. I have already made 2, and plan on using this recipe again. I made this pie as one of the Christmas dinner desserts. Ive made many pies in my many years as a home baker but never a coconut cream. 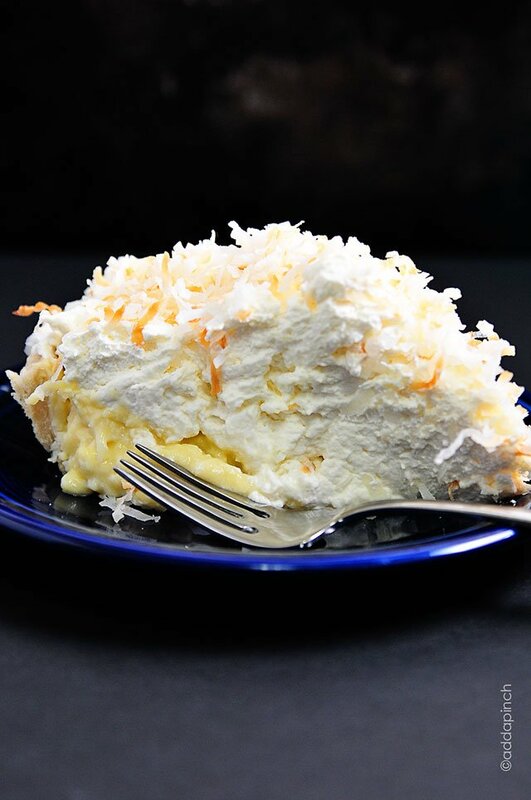 My husband was talking to his brother one day about favorite desserts……..he said that he likes chocolate cake and brownies but his favorite is coconut cream pie. Who knew?? Do you toast the coconut that goes into the filling as well? I never leave feedback, never ever. This time I had to. My daughter turned 20 this year and she has never been a fan of birthday cake. For years I went to a local bakery and bought her favorite pie, coconut cream. This year I decided to try and make one myself. Not that I couldn’t have gone to the bakery, I could have. I wanted it to be more than just a birthday pie. I wanted it to be special, to be made with love. I am SO GLAD I chose your receipe, out of all of the options on the internet I chose yours. She LOVED it!! I want you to know that I have kept it in a special place and every year on January 7th, we will celebrate her birthday with this pie, your pie. Thank you!!!! Oh my Lisa! I am so touched by your comment – thank you so much! I am happy that your daughter and your family enjoyed the pie and so honored that it was a part of your special time together as a family. Thank you! 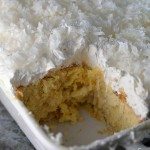 I’m not much of a coconut fan, but I had been thinking about coconut cake when my wife asked me to make a dessert for a lunch date with her friends. I found this recipe and had to try it. When my wife returned home, she was off the ground saying, “That the best coconut cake I’ve ever eaten and everyone thinks it’s the best they’ve ever had, too.” So a sampled a slice of what little was left and I agree. This pie is outstanding. Give it a try, you won’t be disappointed. This recipe is wonderful! My son never had coconut cream pie and the day after we had it for a family dinner he asked me to make another one. I just made my 3rd pie in less than a week (taking one to my friends tomorrow). I have made it with a can of coconut milk and also a can of coconut cream (from Trader Joe’s) and while both are good, I think I like the coconut cream just a little better. Wow, I’m so happy you are enjoying it, Michele! So could I make it using Coco Lopez Real Cream of Coconut instead coconut milk? I have not made the pie with cream of coconut, only coconut milk so not sure how it would turn out. One of my New Years Resolutions was to drop a few pounds. This looks so good that I will take one for the team in order to provide my feedback within the next couple of weeks. I initially made this pie for my husband who adores coconut cream pie. Now it is my go to choice for a treat for him. Along the way, I’ve made it to bring to get togethers with friends. Now, it is what I’m requested to bring every time. It’s that good. I need to bring 2 pies to an upcoming dinner. Can I make and cook a doubled filling recipe, or does each need to be cooked separately? It would sure save time to double it, but I’m not sure if it will thicken properly. I’m so happy to hear that you and your husband – and friends – enjoy the pie! It’s one of our favorites too. Hi, I was looking to alter the flavour slightly by adding lime zest and some lime juice. When would be the best time to add the juice without getting the custurd to curtle? After it has finished cooking? Let me know your thoughts! I’ve not made my recipe with those additions. Thanks! I made this for our fishing club potluck and now I’ve got to this every month! Good thing I love to bake. Lol I was wondering if you might have a recipe for coconut cream pie that is sugar free? So happy to hear that you and your friends enjoy the pie, Amy! It’s one of my favorites too! I don’t have a recipe for a sugar free coconut cream pie. I’m not a fan of coconut cream pie, but this is my friends favorite. So I made this for her birthday. It was so delicious! I have now made 3 of them. I cant believe I’m a coconut cream pie lover now. What can be subsituted for coconut milk? As I have written in the post on this recipe, you can substitute an equal amount of whole milk or half and half for the coconut milk. Hope this helps! This is one of the BEST PIES I have ever made! It was delicious. I made it exactly as the recipe states with the exception of using Dream Whip on top rather than making my own whipped cream. Fabulous recipe!! Thanks, Katie! So glad you liked this recipe. It is one of my family’s favorites. Hello! Can I use this in a deep dish pie pan? Or do I need to increase the ingredients? Just wondering if you can make this a day ahead? Yes, Colleen, it can be made ahead. Just keep chilled in the refrigerator until ready to serve. 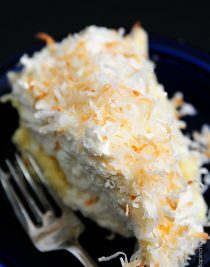 My husbands favourite is coconut cream pie. I just finished making this pie for Easter dinner tomorrow. Although I haven’t tasted the pie as a whole with crust and whipped cream the filling is divine!!! I didn’t have time to make a pie shell from scratch I used a frozen one as such I had filling left over. Delicious just in a bowl. Will be making this from now on. So glad you liked this, Michelle. Can’t wait til you try it with the crust and whipped cream added. It is so good! Best coconut cream pie! Great recipe and simple to make. 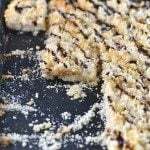 The only thing I did differently was to use unsweetened shredded coconut rather than sweetened. I also made the pie crust and whipped cream referenced in the recipe. Other coconut pies I have made in the past have been too sweet. This one was just right. The custard was soooo good!! I made it for Easter and everyone loved it!